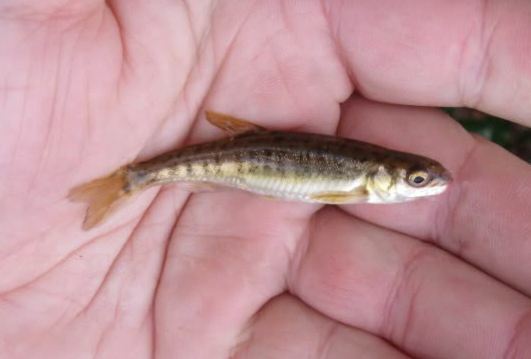 Minnows are one of the most abundant and effective sources of bait for fishing. They are found in pools of shallow water by the hundreds and are free. However, they are difficult to catch if you do not know what you are doing. There is also a right way and a wrong way to use minnows while fishing. In this article I will cover several different ways to catch minnows for bait. I will also cover how to properly store and hook minnows to catch your limit of fish on your next outing. With just some cordage and a 2 Liter bottle you can make an effective minnow trap to collect bait for your next fishing trip. Here is how to put it together. Cut the bottle in half just below the bend at the mouth. You will be cutting through the thinner plastic of the side wall, so any knife or pair of scissors should do. Be sure to cut in a straight line as the edges will have to match up. Reverse the mouth of the bottle and insert it back into the base of the bottle. Push it down until the cut edges line up. Cut several holes around the cut edges being sure to cut through both layers of plastic. Make them large enough to run cordage through the holes. Run cordage through the holes and tie them off to secure the top to the base. The thickness does not matter as very little weight will be put on the trap. Poke several small holes in the base of the trap to let water flow freely in and out. Make sure they are small enough that minnows cannot get through them. Anchor the trap by putting a few small stones inside. Ideally you want just enough weight to keep the trap from floating to the surface. Tie a long piece of cordage through the holes you cut in the base and tie the other end to something secure on the shore. Add bait such as bread crumbs or crackers to the trap and throw it into the water. Check your trap every 24 hours if you can let it sit that long. A Seine is a small square net that is used to trap minnows. You can buy them online or sometimes at fishing retailers. This techniques is used to quickly catch minnows versus leaving a trap overnight. Attach two sticks on either side of the seine. They can be attached with cordage, staples or zip ties. Sharpen the ends of the sticks on one end so you can drive them into the ground. Find a spot in the stream where minnows are prevalent and also have to swim around large obstructions such as rocks or logs. Drive the sharp ends of the sticks into the creek bed so that it sticks up straight and will not wash away. Wait about 15 minutes and lift your seine out of the water. You should have plenty of minnows stuck in the net. There are traps you can purchase called torpedo traps that are essentially long cylindrical cages. Each end has a funnel pointing into the trap with an opening at the end. You place bait in the trap and anchor it in shallow water. Once the minnows swim into the trap, they cannot find their way back out. This is probably the most expensive way to catch minnows, but also the most effective. This process is relatively simple. You need a net with a fine mesh so small minnows cannot escape. Simply lower the net gently into the water and suspend it just below the surface. Sprinkle some bread crumbs or corn meal above the net and wait. Once the minnows swarm above your net, quickly raise the net trapping them. Then just dump them into your minnow bucket and repeat the process. If you have no bait or net and need minnows, there is still a way to catch them. Wade out into the water until it is about one foot below your shoulders. Raise the front of your shirt up so it forms a net. Then just spit into the water above your shirt and watch the minnows rush in. Stand and raise the net trapping the minnows, and then dump out your bait. Small fish are attracted to human saliva for some reason, so you can use that to your advantage. There are a few things to remember when storing your minnows for use that day or another day. Do not put more than 15 minnows in one gallon of water. Overcrowding will cause them to die faster. Never use tap water to store your minnows. The chlorine will kill them, so use creek water or distilled water. Keep your water aerated using an electric aerator or by allowing creek water to flow in and out of your container. This will keep oxygen in the water for your bait. Live wells in boats do this for you. Keep the water cold. If needed, throw some ice cubes in the water. You can also use a cooler to store your minnows. Simply put down some ice cubes, lay down a wet towel, and lay your minnows on top. They should stay alive for a day like that. When putting a minnow on your hook, there are three ways to do it. Your goal is to do as little damage to the fish as possible so it can swim freely and can stay alive for long periods of time. You can hook through the lip which does no damage to the internal organs but does restrict movement somewhat. You can hook them through the tail to give them free range to swim, but they will bleed more. Finally, there are threaders you can purchase that insert the hook in a way that allows movement and does not hit any vital organs.